And look! 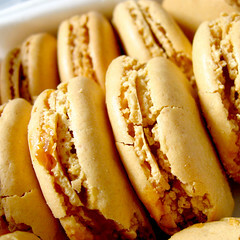 An whole box of caramel macarons for me (to share?)! While traveling Europe, she sent home some Ladurée macarons with a friend. Knowing that it would be a long and arduous journey for such delicate cookies (5 days!) before they got into my hands, she came up with a game-plan for optimal freshness. While they didn’t all perfectly survive, (I will suggest bubble-wrap to pad the boxes next time) most of them made it and were in relatively good shape, despite being in the checked luggage. And well, they’re still really, really, yummy. 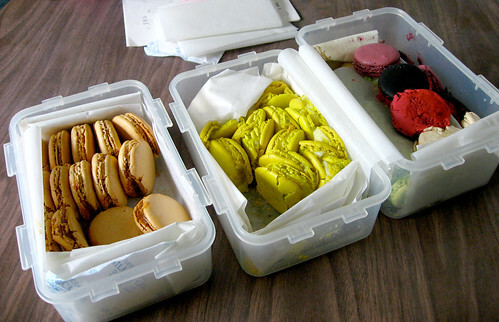 But if you think you’ll be in France soon and want to ensure the best survival rate for your macarons, read on! Tightly sealed tupperware. I like the Lock & Lock brand. Desiccant. She raided other packaged foods that had them. 1-2 per box depending on size. Bubble wrap. Didn’t have this. Next time! Parchment paper. Or wax paper will do too. Most of this should be done before you leave. Step 4 is prepping and storing the materials for your on-site packing. Make sure your tupperware is the air-tight kind, with the rubber lining around the lid and locking-flaps. Check out the boxes in the photo below if you don’t know what I’m talking about. Line your box with the bubble wrap on all 5 sides. Cut a piece for top cover (side 6). Very important! Then proceed to line your box with the parchment. This is more so the macarons aren’t sitting right next to the bubble wrap. You can slide in your gel packs between the bubble wrap and parchment if you like. Cut more parchment into strips, about 2 inches wide. This is so you can weave the strips between your macarons to prevent them smooshing together (see the middle box below re: smooshing) during transit. Store this in the box until you need it. A whole box of caramel, a box of bergamot, and an assortment of pistachio, the special red/black Christian Louboutin (!) ones with a fig filling, a black currant in one and another had us guessing. 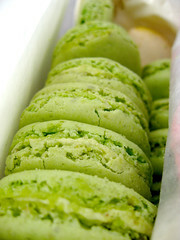 Lovely and green pistachio macarons from Ladurée. So there you have it. A way to bring home some of those lovely and delicate cookies called macaron (not to be confused with macaroon! ), to share (or not) with those back home. For all you intrepid foodies, my sister informs me that the Ladurée clerk at the pastry counter will likely give you a funny look if point to your tupperware and ask them to pack the macrons there and that you just want clean, flat, take-out boxes on the side.